CompareMatch – HR Tech Discovery Made Simple. Finding the perfect HR Tech software in today’s world can be critical to your company’s success. Whether you run a small business or a thriving one, purchasing the right HR Tech is one of the most important aspects of your business. Implementing the wrong solution can be a drag on your time and pull you away from other critical tasks such as maximizing profit, growing market share and building your company. The right HR Tech can help you manage your organizational and talent challenges, as well as makes your job much simpler. So how do you decide on the right solution when vendors all seemingly say and offer the same thing? Do you ask trusted friends, work associates, or seek an industry analyst? The average B2B buyer conducts extensive research before ever engaging with a software vendor. Research tells us that 74% of B2B buyers complete more than half of their research online before making a purchase decision. If you are part of that 74% then it’s likely you begin a labor-intensive effort, which drains your time and resources. After researching, talking with peers, sifting through spin, reading through specs and sorting through endless Ads, products and data, you still may not find the right tool to suit your company’s software needs. It is no secret that B2B buyers often turn to peers as their most trusted resource during the selection process. In fact, 77% of people take the time to read product reviews before they make any purchases online. However, most are lured to a product they might not want instead of one that can actually help them. In many cases, online sites often display fake reviews or paid reviews from “Subject Matter Experts” who use subtle persuasion to steer you towards whatever product their company is selling. Who has time to waste and who wants to take the advice of an advertisement or a paid sponsor? Do you want your company’s success to rest on the word of a paid “expert” speaking on behalf of a certain product or on the randomness of a keyword generator? Of course not, that’s why you have to trust any source you’re receiving information from. Meet CompareMatch, a search platform that helps you discover, compare, and find your product match. With CompareMatch, you have access to a collection of more than 1,100+ HR Technology and recruiting products. Each product listing provides comprehensive information including founder names, date established, funding received, number of employees, company and product overview, product specifications, pricing, ratings, reviews, and much more. CompareMatch doesn’t work for any particular software vendor or company. Easily cut through all of the sales pitches and marketing spin to find solutions that will suit your needs. Effortlessly eliminate the wrong options and find the right HR and recruiting software using our simple side-by-side comparisons. CompareMatch caters to HR Tech buyers, vendors and providers alike. It is a convenient platform that isolates the most relevant software based on your parameters. Vendors can claim their company profile page for free and easily enhance their page to attract and engage the right buyers, generally a Herculean task. CompareMatch allows users to easily provide feedback on products they have used. All new members are authenticated using Linkedin to help ensure professionalism, as well as maintain content quality and data integrity. Every new product review is fully vetted by our team prior to posting. Information is available for both vendors and tech buyers. Nobody is misled about any product and the right audience is targeted. CompareMatch is a free platform connecting buyers with vendors, providing solutions that match your needs. What are you waiting for? 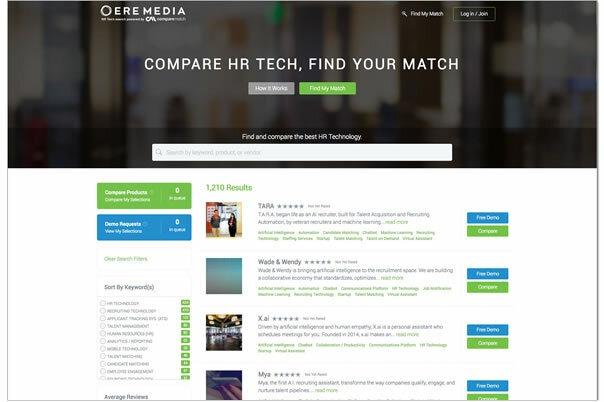 Find your ideal HR technology and recruitment software on CompareMatch now. Michael Marlatt is an Executive Recruiting Partner at Cognizant Technology Solutions. He has close to 20 years of industry experience and is deeply passionate about innovation in recruiting strategies and technologies. Michael has a diverse background, which includes sourcing, training, and entrepreneurship. He has consulted for top-tier companies such as Amazon, Microsoft, Deloitte, Capgemini, as well as for start-up organizations. He previously founded and ran MREC (The Mobile Recruiting Conference). Michael's passion for emerging technologies led him to build CompareMatch, a discovery platform for searching and comparing software solutions for HR and talent acquisition. Follow @MichaelMarlatt or email him.